Whether for shopping, exercise, sightseeing, or running errands, most parents will agree that a good stroller or pushchair is one of their most useful pieces of baby equipment. Once babies are old enough to sit up and support their heads well, there is a wide variety of strollers on the market today to meet their needs, as well as those of their parents. Strollers and pushchairs vary widely in cost, but less expensive options do not always represent the best overall value. It is important to choose a model that is well constructed and sturdy enough to transport babies in safety and comfort. 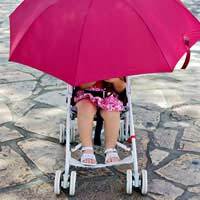 While it can be tempting to make your selection based solely on price, most parents put a considerable number of miles on their strollers, so although you have to respect your budget, you must also take into consideration the fact that you will be using the stroller regularly for several years. Before spending your hard earned money, take a few moments to consider where and when your stroller will be used. If you take public transportation or do a lot of shopping, a compact, a lightweight model would be a good choice. Parents who enjoy nature walks or plan to take their baby on a lot of excursions to the zoo or other places will need a sturdy, durable stroller with a wide base and large, comfortable seats. Fitness-minded parents will be impressed by the nice variety of strollers designed for jogging, offering lightweight yet high performance components. Depending on their future plans, some parents will need a stroller that can transport two children of varying ages. While some pushchairs and strollers are specifically designed for multiples, many of these do not take into consideration that the children may be at different stages of development, and that although older children may be capable of walking part of the way, they tire easily on long walks. Some pushchairs offer an option to attach a platform so that older siblings can hitch a ride with the baby when they need a break. Also, if planning to use the pushchair or stroller for future children, be sure to choose a pattern that is unisex. While many online merchandisers offer terrific selections of pushchairs and strollers, you may want to do your initial comparison shopping in a hands-on way. Look for strollers that manoeuvre easily and feel solid, even if they are lightweight. Once you have decided on the model that you prefer, you can compare prices at various retailers, both online and brick and mortar, to assure that you get the best price. Comfort and convenience are terrific, but safety is foremost when it comes to choosing any equipment for babies and young children. Be sure that you assemble your stroller or pushchair according to the manufacturer's instructions, and check regularly to be sure that all parts are in good working condition. Before choosing a previously used pushchair or stroller, check to see that it hasn't been involved in a manufacturer's safety recall.